Spring is here… The trails are soggy… the peepers are out… leaves are budding… the woods beckon… It must be time for the Leatherman’s Loop! 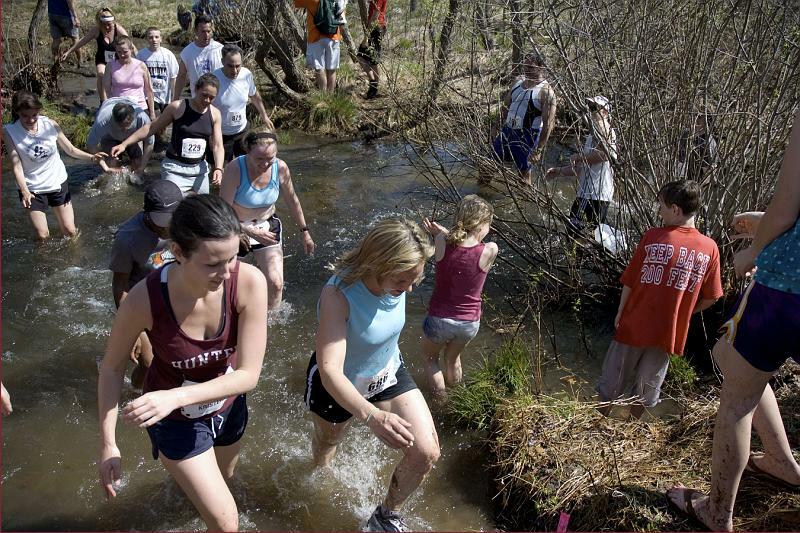 Welcome to the 24th running of the Leatherman’s Loop Trail Race on April 25th, 2010! Race director Mike Paletta and the reliable Leatherman’s Loop volunteers have been working since last year to set up this year’s event. Tony Godino says we are nearly ready to go for this year’s Loop. All we need is YOU! Below are some important instructions regarding this year’s race. Registration is at the highest level ever so we will need to work together to ensure that loop day goes smoothly. The park staff and our volunteers will all be working to kick this event off and leave great memories for each of you. so entry should go more quickly. We changed this in 2008 and all reports were that it made for a much more efficient entry for everyone. It is always wise to arrive earlier than you think you need to in order to make sure you are all set by race start time (9am). This is especially true if it is your first time running the Loop. 2) DRIVE SLOWLY and CAREFULLY in the Park! Watch the volunteers who are directing the parking. PARK TIGHT! Did we say car pool? Remember, April is Earth Month! John Jay High School and Middle School are just 3 minutes from the entrance to the Rez (up 121 north) and should have plenty of spots open Sunday morning. There is also the Katonah Train Station lot (which is free on weekends) just off 684 Exit 6 (Route 35) on Woodsbridge Road. Plan ahead—consolidate 2 cars into one if you can. 3) BRING A FULL CHANGE OF CLOTHING! After 23 years we have never seen a runner emerge dry and clean from the woods. You will get wet and you will get muddy. Where and how you change is up to you. Towels are a must. 4) LISTEN ATTENTIVELY TO PRE-LOOP ANNOUNCEMENTS! We only get to see you guys once a year and need a few minutes before the start. Race Director Mike Paletta will have important information about the course and safety. Danny Martin will give a brief poem/blessing to set the tone. We will have a special guest in addition to Caballo Blanco who is our official Loop starter this year. Also, you will be instructed about the hazards related to the stream crossings and current water conditions. Hidden boulders and slippery ledges lurk under the surface of the water. Slow down and DON’T DIVE into the water under any circumstances. As a courtesy to those further away from the speakers we ask that you remain quiet for the sake of your fellow racers who may have never heard the instructions. 5) LISTEN FOR THE START! 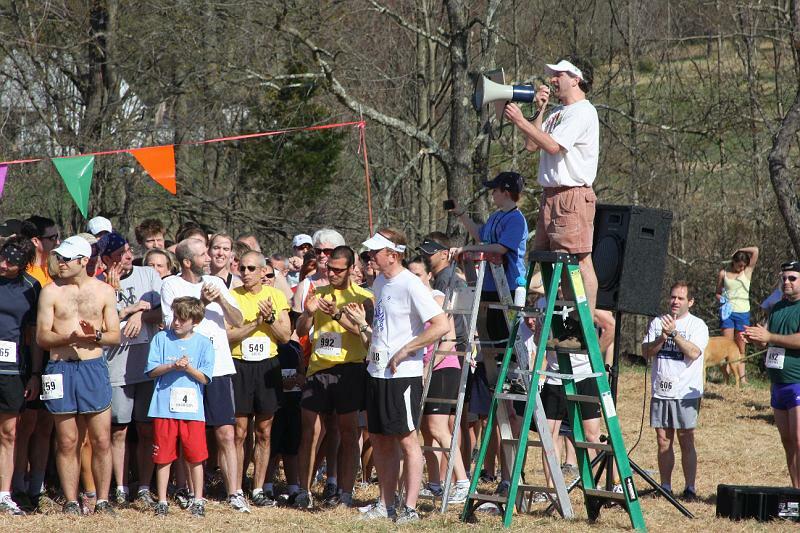 In the past we’ve used a starter’s pistol, a major league pitcher, and an air horn… You never know what sound will launch the runners—so keep those ears bent and listening. 6) IF YOU SEE MUD, RUN THROUGH IT! Especially at the entrance to the woods immediately after the start. If you stop—or simply hesitate—the people behind you may crash into you… trust us. There’s no avoiding the mud so simply embrace it, get dirty, and get going. 7) WATCH FOR THE LEATHERMAN! Remember that this event celebrates the life of the Leatherman. Learn his story and by all means make some noise if he is out and about on Sunday. 8) STAY ON COURSE IF YOU CAN’T CONTINUE! There will be four “sweeps” running the course following the slower runners. If for any reason you can’t continue, wait for them to get to you to assess your needs. The park is nearly 5,000 acres so don’t leave the course unless you know exactly where you are going. 9) THERE IS NO SAME DAY REGISTRATION! We simply do not have room for any more registrations. Please understand the position we are put in when we have to refuse someone entry. If someone is interested in next year’s loop, there is a form at the website to submit name and email address. If you are signed up for this year’s Loop you are already on this email list. 10) BRING FOOD DONATIONS! Don’t forget donations for the second Feed the Leatherman Food Drive. Bring your non-perishable donations to the Loop and we will have a drop off point near the registration trailer. Your generosity will benefit the Community Center of Northern Westchester. Thanks to David Ceisler for spearheading the drive for a second year. 11) LEARN ABOUT THE LEATHERMAN! Author Dan DeLuca will be on hand during the Loop. He will have copies of his new book on The Old Leather Man available for purchase and signing. A portion of the proceeds of the book sales will go to fund a project that aims to reinter the Old Leatherman in a proper gravesite and a corrected headstone. 12) LEARN ABOUT THE TRAILS IN WESTCHESTER and beyond: Jane and Walt Daniels, authors of Walkable Westchester, will have information and copies of their local trail masterpiece available for purchase. They also have information about the New York New Jersey Trail Conference and becoming a member of that organization. The trail conference website is chock full of trail information in the NY and NJ area. 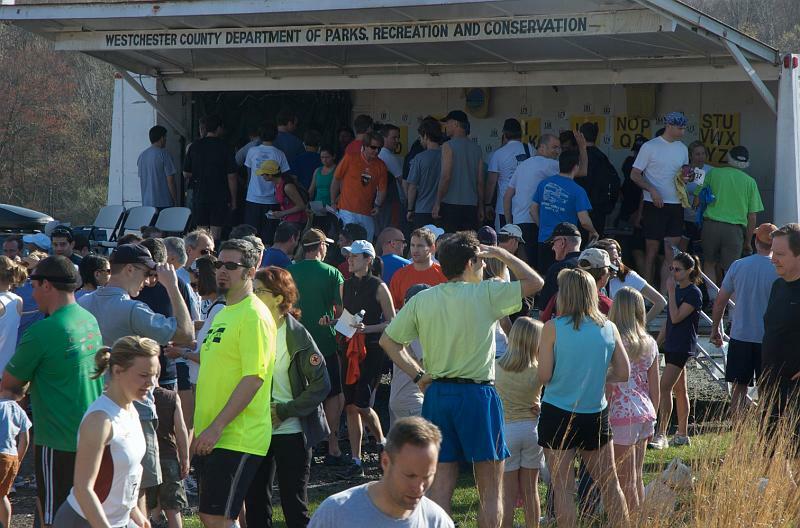 13) RESULTS: Printed lists of finishers with time and place will be available soon after the finish at the bib pickup area and shortly after that on the Loop website. Check it out at http://www.leathermansloop.org. 14) THANK A VOLUNTEER! A tremendous amount of volunteer effort goes into making the Loop a special event each year. T-shirt designers, registration volunteers, pie buyers, course setters, bib stickers, box lifters, water servers, food preparers, coffee brewers, parking coordinators, and the clean-up crew—not to mention the Pound Ridge and Lewisboro Police and the fantastic and dedicated members of the Lewisboro Volunteer Ambulance Corps! Due to the largest ever running field expected for the 24th Loop, we must ask some runners to voluntarily hold back a few minutes at the start of the Loop. 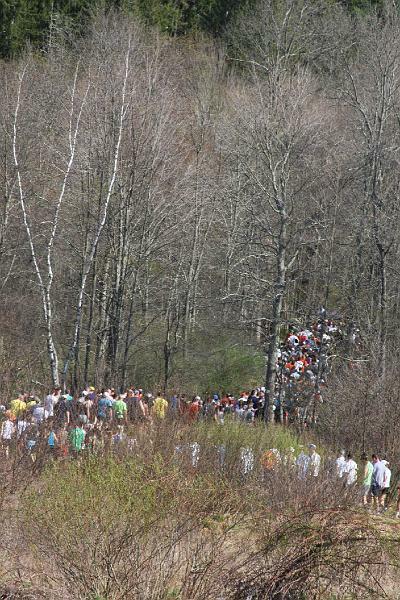 There is a potential for a larger than normal bottleneck at the entrance to the woods approximately 300 yards from the starting line and in the early trails. If you conserve energy at the start you will have more left in the tank for the second half of the Loop when the trails are wider, the crowd is thinner, and passing is sweet! This is a one time expansion of the running field and we will drop back to the normal runner cap for next year. This event is truly a group effort and tribute to the spirit of the community. Your notes of support and encouragement feed the goodwill and energize the volunteers who organize and pull off this one of a kind event. We are grateful that we have such a wonderful group of Loop enthusiasts and are thankful that we have the thousands of acres of parkland at the Rez to enjoy!